Today I begin a new course at Ashland Theological Seminary: Homiletics. I am about 1/3 finished with my seminary studies. I am definitely taking the slow road to completion. I only take one course at a time, because I don't want my studies to interfere with my job at Crossroads or my family life at home. I figure I can take one course at a time, enjoy it, benefit from it, but not be overwhelmed by it. There are two drawbacks to this strategy: cost and time. It is the most expensive way to take classes because one doesn't benefit from the cost breaks with more classes. It also takes more time. There are 36 courses one must complete for the M.Div. degree, normally a 3-year program for full-time students. I've already been going for 3 years and I figure at this rate I have another 6 years in front of me. However, I'm absolutely loving everything I am learning. I also love being with the many other students at ATS. I figured I would be the oldest one there when I first signed up. I have since found this not to be the case as many other second career men and women are also in my classes. It's a great mix of younger and older students. The basic course in homiletics is designed to introduce students to the history, theories, methods and purposes of preaching. The course is designed to introduce students to a variety of methods for the development, delivery, and evaluation of sermons. The students will be aided in understanding how to do biblical exegesis for preaching and how to use a lectionary or some other method of text and topic selection that will allow them to keep their preaching biblically focused and doctrinally solid. 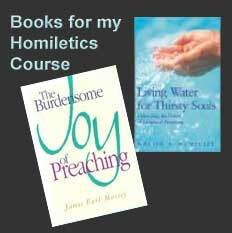 Our textbooks are The Burdensome Joy of Preaching, by James Earl Massey and Living Water for Thirsty Souls by Marvin McMickle. The schedule today will be challenging. Usually I take evening classes. But this quarter I registered for a Monday afternoon class. Mondays are my day off, so I figured this would work out well. However, I'm still returning from vacation. Hopefully I've worked it out so that I arrive in time for my 1:30 PM class.